Mixing up my training plan with 1,034 stairs…. It’s important to mix up your training. Today I completed the Milwaukee Fight for Air Climb at the US Bank Building. 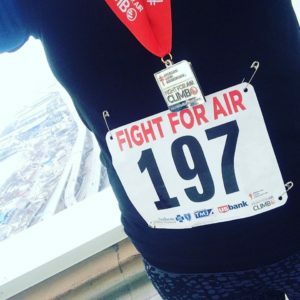 The challenge was to to climb 1,034 stairs for the American Lung Association. It was a challenge and I sure did get a workout in while completing this. My finishing time was just under 16 minutes and I can’t wait to try and beat that time next year.